Lama Ole Nydahl, a western Buddhist Lama, has written the most comprehensive relationship book to date. 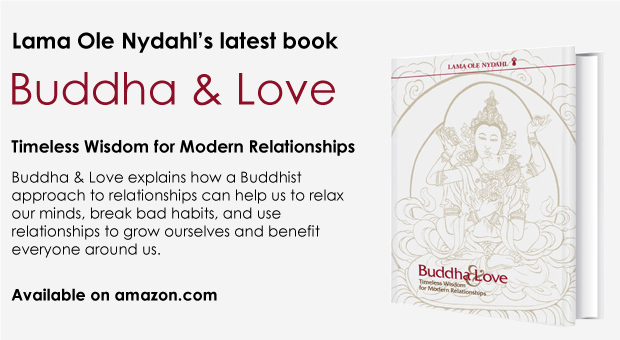 Buddha & Love explains how a Buddhist approach to relationships can help us to relax our minds, break bad habits, and use relationships to grow ourselves and benefit everyone around us. Unafraid of taboo topics, and free from sappy clichés and political correctness, Buddha & Love provides both women and men with practical advice on how to love better. The Buddha & Love is available now and can be purchased from Amazon.com! You can read a chapter of the book here, and watch the video below where Lama Ole discusses Buddha and Love. Please see the latest video from Lama Ole below. We are very happy to announce the release of the first in a new series of short talks by Lama Ole Nydahl on YouTube. The short video talks, in English and German, will first start to be available on YouTube and iTunes. A new topic will be released every month in both languages. Subtitles for other languages will be added on YouTube soon. The first videos are “Discover your potential” and “Anleitung zum Glück”. The first video (in English) is here, you can also access them under the YouTube user name “BuddhismDiamondWay” or by clicking the direct links below.